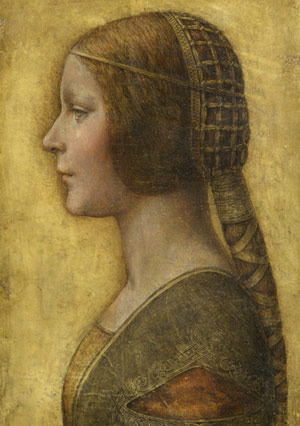 Remember when there was a lot of hype over "La Bella Principessa," the painting recently attributed to Leonardo? It looks like similar excitement has built over a new painting, which possibly could be attributed to Raphael (shown right). The painting was discovered in a storage room in the ducal palace of Este, located in Saussolo (outside of Modena, Italy). Mario Scalini, state art superintendent for the area, was going through the storage inventory and found the painting tucked away. After noticing the high quality of the painting, he wondered if it could actually be by Raphael (instead of an 18th century painting, as it was previously described). There was no record of a Raphael currently in the estate collection, but Scalini went through the ducal archives and found a 1663 reference that mentions a "portrait of a woman" by Raphael. There is no record that this Raphael painting was ever sold from the collection or loaned, so it could be that this painting was simply forgotten. It will be interesting to see what results from tests and analysis of this painting. The History Blog points out that recent tests have revealed the painting was restored in the 17th and 19th centuries, which shows that the painting is older than the 18th century. In addition, these restorations also show that artwork was valued, since people made the effort to restore the painting throughout different centuries. So, what do I think of the possible attribution to Raphael? I think it's possible, but I'm trying to not get too excited. At this point, I think the most exciting discovery is that a Raphael painting was listed as part of the ducal collection. In regards to the painting itself, I'd recommend that you read this great post from Art History Today, in which the author discusses some reservations about the painting being by Raphael. I agree with the ideas that are presented there; I think it is possible that this painting might be by a student of Raphael (perhaps Giulio Romano? ), but not the master himself.